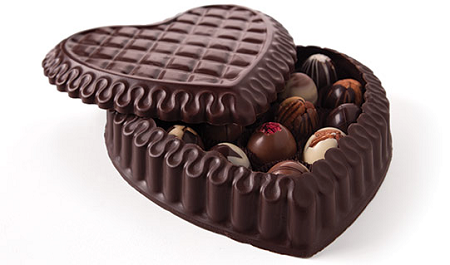 Heart Shaped Filled Chocolate Boxes For Valentine's Day, an Anniversary or a Birthday ! 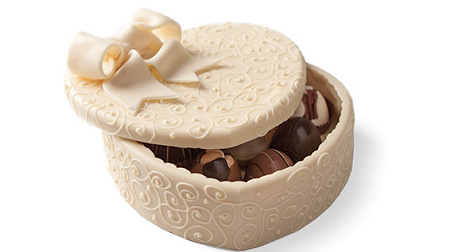 The White Chocolate Heart Box is handmade with creamy white chocolate and decorated by hand with elegant swirls and a delicate white chocolate bow. One white box is filled with a Classic Collection consisting of timeless favorites such as luscious caramels, all-natural fruit creams bursting with wonderfully intense flavors and many other unusual and traditional varieties. What a truly classic and romantic gift! 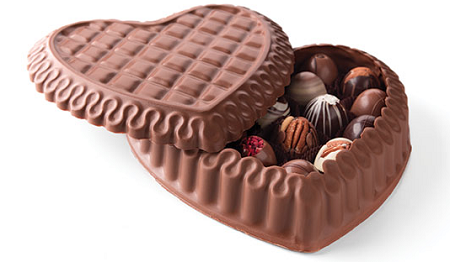 Box size: Approximately 8" diameter x 2 1/2" height (plus additional 1 1/2" bow height). Our artisan Art Boxes are handmade and therefore no two will be identical. Another white box is filled with a Truffle Collection - including Almond, Black & White, Caramel, Coconut, Dark Chocolate, Deluxe Nut, Key Lime Pecan, Macadamia Hazelnut, Milk Chocolate, Mocha, Peanut Butter and Raspberry. Each silky, rich truffle is like a petite, luxurious chocolate dessert. What a truly classic and romantic gift! Box size: Approximately 8" diameter x 2 1/2" height (plus additional 1 1/2" bow height). Our artisan Art Boxes are handmade and therefore no two will be identical. And yet another white box is filled with a mixture of Milk and Dark Deluxe Nuts. What a truly classic and romantic gift! 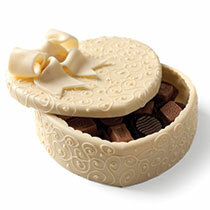 Box size: Approximately 8" diameter x 2 1/2" height (plus additional 1 1/2" bow height). Our artisan Art Boxes are handmade and therefore no two will be identical. Also available as Empty Chocolate Art Boxes - add your personal touch by filling it with your own home confectioned and baked goodies. See Item # 287. Allergy Alert: DeBrand products may contain traces of dairy, wheat, peanuts, tree nuts and/or shell fragments.